1. Why should I outsource and risk losing stock control/increasing costs? To put it simply: speed, efficiency, unit cost and… control. By outsourcing to Carlow Warehousing you will form a partnership with a dedicated logistics provider who will increase the efficiency of your business. Not only can we fulfil all of your needs promptly and accurately – allowing you to focus on other core business matters – we can also do this at the lowest unit cost possible. Our expertise and technology mean that by outsourcing to us you will save money as your unit / order costs will fall. 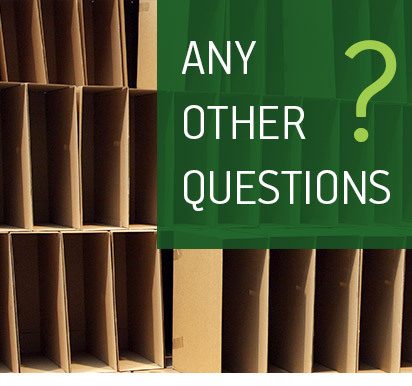 As for stock control, you will always be able to find out exactly how much stock we hold for you, the status of deliveries and the whereabouts of customer orders… just as you would do if you were holding the stock yourself. 2. If I outsource, will my customers know? No. Your name remains on all deliveries we dispatch. Every order – including online orders – that we handle comes from your network. Customers, whether big or small, will never know of Carlow Warehousing’s involvement as we use your branding and company name on the packaging and order packing slip. Similarly, with any returns, deliveries will be made directly to us but the address label will show your company details. 3. How do you organise your billing? How much will this service cost? Billing will depend on the nature of your business and the goods we stock/distribute for you… but we will work with you to find the most appropriate solution. The cost of the service is typically based on a per unit/order cost so, again, this will depend on the nature of your business and the size / weight of goods. When it comes to e-commerce fulfilment you can be sure that our technology will help you to reduce your current costs. 4. How difficult is it to set up e-commerce operations? Remarkably easy. There are also different financial platforms you can use when it comes to setting up your operations. We’re happy to help you set up your buying platform, if you require. Our software has been designed to be SAP compatible so that it will marry with yours with minimal disruption. Some software development may be required to align our system with yours, but this is fast and easy to implement. 5. Do you handle online payments? We do not need to deal with online payments during the logistics process and, by leaving the financial aspects to you, you retain full visibility and control over online payments. 6. How will I know where my customer’s order is? All orders are fully traceable via tracking numbers viewable online. 7. How do you / I deal with customer complaints regarding non-delivery / damaged goods / returns? Returns and Non-Delivery are merely another part of the process that we handle and our fully integrated software ensures that you are notified of any such returns and how we handle them immediately. 8. How secure are your premises? Carlow Warehousing has 24-hour security. Both premises have full CCTV coverage and they are monitored 24 hours a day. Your business is our business, and we do not take security lightly. 9. What shipping options do you offer? Within Ireland, we guarantee next day delivery. We also guarantee same day dispatch to all other regions.